On the outbreak of war in August 1914, Collingwood Ingram joined the Kent Cyclists, in effect the 'Home Guard' of WW1. His ornithology was limited until, in May 1915, he was ordered to bring his Company (he was now a Captain) to Romney Marsh for training. Whenever his duties allowed he headed for Dungeness, a vast expanse of coastal shingle, a haven for breeding shore birds and an important staging post for migrants. It was the last regular British breeding site for the Kentish plover and the home of the stone curlew, little and common terns. Collingwood also discovered a nightjar nesting on the shingle. Some extracts from Collingwood Ingram's Dungeness Journal were put online by RSPB Dungeness in 2014. Now we present the whole journal, with each day's entry put online. The diary takes us back in time to enjoy the birds of Dungeness through Collingwood Ingram's eyes and ears. 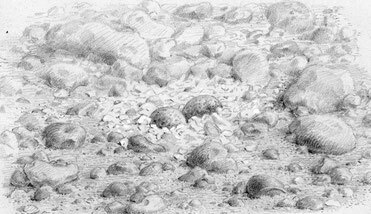 The journal also tells us much about Collingwood Ingram as an ornithologist and bird artist. 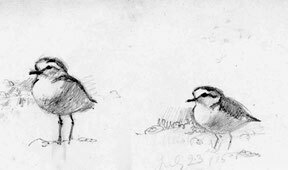 He had great observational powers and, rarely amongst his contemporaries, was intensely interested in living birds and their behaviour. Young birds were a special interest and in 1920 he published a landmark paper in Ibis, A contribution to the study of nestling birds. His studies entailed disturbance of nestling and parent birds that would not be allowed today except under license. It would not have occurred to him or to most ornithologists of his time that he was doing anything untoward, and his motivation was love of birds and scientific curiosity. His subsequent publications added significantly to scientific knowledge. 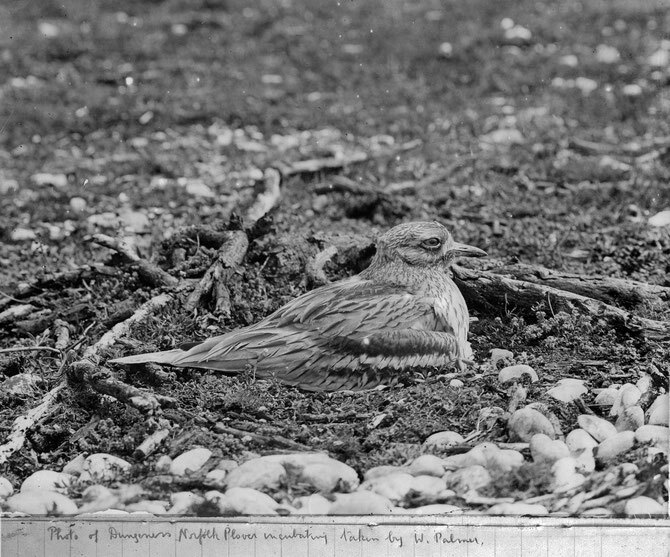 Stone curlew (Norfolk plover) at Dungeness in 1915, photograph taken by W. Palmer, a friend of Collingwood Ingram. Later in the war, Collingwood joined the Royal Flying Corps as a Compass Officer and served in France. 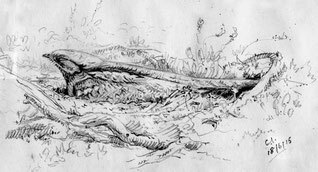 Again he kept diaries, a strange mixture of birds and war, and again they were illustrated by beautiful pencil sketches - see the Wings over the Western Front and Royal Flying Corps pages of this website.